Designed to strengthen the deep (stabilizer) muscles which stabilize joints and ligaments, core stability exercises are important for the development of motor skills in athletes. In this research, we aimed to determine how a two-year program of core stability and functional exercises influenced the strength and speed of female football players. The tested athletes (n = 17) were members of Olimpia Szczecin MKS, a first division football club from Poland. Their mean age was 19.8 ±1.4 years, while the mean duration of sport experience was 6 years. We analyzed their running speed, as well as the maximal strength of eight major muscle groups: rectus abdominals, abdominal oblique, shoulder girdle, chest, upper limbs, quadriceps, biceps and gastronomies. The effects of training on motor speed and strength were measured twice, prior to each of the two seasons. The functional training resulted in significant changes in the strength of various muscle groups: quadriceps (Δ17.1 kg; p < 0.05), abdominal oblique muscle (Δ9.1 kg; p < 0.05), shoulder girdle (Δ3.6 kg; p < 0.05) and chest (Δ3.5 kg; p < 0.05). There was also a significant reduction in the time of the 30 meter sprint (p < 0.05) (Δ0.1 s; p < 0.05). In summary, functional training had a positive effect on the strength and running speed of the tested female footballers. 1. Barnes D. What type of strength training do distance runner do or need? Modern Athlete Coach. 2002; 40: 27–37. 2. Beam J.W. Rehabilitation including sport-specific functional progression for competitive athlete. Journal of Bodywork and Movement Therapies. 2002; 6 (4): 205–219. 3. Boyle M. Functional Training for Sports. Human Kinetics. 2004: 155–167. 4. Clark C.A. Integrated neuromuscular stabilization training. National Academy of Sports Medicine. 2001. 5. Duncan R.A., McNair P.J. Factors contribution to low back pain in rowers. Br J Sports Med. 2000: 34; 321–322. 6. Haynes W. Core stability and the unstable platform device. Journal of Bodywork and Movement Therapies. 2004: 88–103. 8. Nesser T.W., Huxel C.K., Tincher J.L., Okada T. The relationship between core stability and performance in division I football players. J Strength Cond Res. 2008; 22 (6): 1750–1754. 9. Paterno M.V., Myer G.D., Ford K.R., Hewett T.E. Neuromuscular training improves single-leg stability in young female athletes. 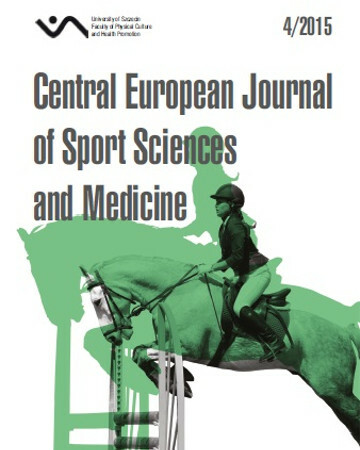 Journal of Orthopedic and Sports Physical Therapy. 2004: 305–316. 10. Reed C.A., Ford K.R. The effects of isolated and integrated ‘core stability’ training on athletic performance measures: a systematic review. Sports Med. 2012: 697–706. 11. Sato K., Mokha M. Does Core Strength Training Influence Running Kinetics, Lower-Extremity Stability, and 5000-m Performance in Runners, J Strength Cond Res. 2009; 23 (1): 133–140. 12. Ścibek J.S., Guskiewicz K.M., Prentice W.E., Mays S., Davis J.M. The effect of core stabilization training on functional performance in swimming. Master’s thesis, University of North Carolina, Chapel Hill, 2001. 13. Sharmann S.A. Diagnosis and Treatment of Movement Impaired Syndromes. St. Louis, MO, Mosby. 2002: 121–129. 14. Sharrock C., Cropper J. A pilot study of core stability and athletic performance: is there a relationship. Int. J Sports Phys Ther. 2011; 6 (2): 63–74. 15. Stanton R., Reaburn P.R., Humphries B. The effect of short-term Swiss ball training on core stability and running economy. J Strength Cond Res. 18; 2004: 522–528. 16. Stein N. Stabilisierungsprogramme von den DFB-Juniorinnen bis zur Frauen-Nationalmanschaft. Fussballtrainning. 2008: 20–35. 17. Tse M.A., McManus A.M., Masters R.S.W. Development and validation of a core endurance intervention program: implications for performance in college-age rowers. J Strength Cond Res. 19; 2005: 547–552. 18. Wilson J.D., Dougherty C.P., Ireland M.L., Davis I.M. Corestability and its relationship to lower extremity function and injury. J Am Acad Orthop Surg. 13; 2005: 316–325.